Security Analysis: Sixth Edition, Foreword by Warren Buffett is one of the most significant books in the history of financial analysis. The theory on which this book is based, was subsequently called Value Investing. The book attempts to teach the investors a new approach to assess the business that lay behind security. This book contains many examples based on actual events to show the tendency of markets to undervalue some securities that don't seem to be favorable. It explains how this could help the savvy opportunists, if assessed rightly. It basically shows how an investor who is professionally trained can utilize the financial analysis of the corporation to determine the intrinsic value of a company. Security Analysis further explains how Graham's margin-of-safety principle can be used to make profit. It shows the investors how stocks can be bought when the market price is way below its original value and then earn good returns. The book also discusses the genesis of corporate finance and financial analysis. 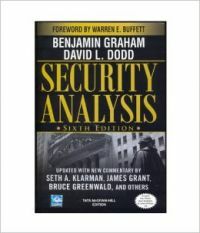 Security Analysis: Sixth Edition, Foreword by Warren Buffett was published on 25th November, 2008 and is available in hardcover. It includes a short introduction to the book by Warren Buffet who benefited immensely from this book. Key Features: This bestselling book has sold more than a million copies. The book is used as a textbook in Columbia. This book is the longest running text in the field of investment theories ever published. Benjamin Graham was an American professional investor. Popularly known as the Father of Value Investing, his investment approach attracted a lot of followers. He had a job on Wall Street and started the Graham-Newman Partnership. Apart from this book, Graham has also authored the Intelligent Investor and Storage and Stability.David LeFevre Dodd was a famous American author. In addition to that, he was also an economist, financial analyst and professional investor. He has worked as a Research Assistant at National Bank of Commerce in New York. Apart from co-authoring this book, Dodd also wrote Stock Watering.